Subject: Regular verification of Internet Bank Accounts! 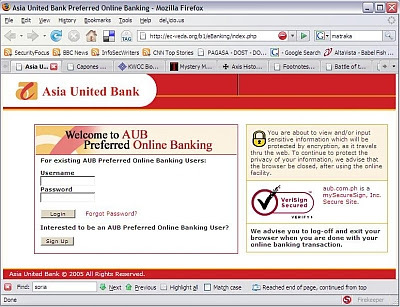 During our regular verification of Internet Bank Accounts, we could not verify your current information. Either your information has been changed or incomplete, as a result your access to use our services has been limited. Please Update your information. Please fill in the required information. This is required for us to continue to offer you a safe and risk free environment. and as of this writing (july 13, 2007). It's been almost three weeks and the phishing site's still up with. I wonder if there're really people tricked by this email when it's so obvious it's a scam...but you'll never know.